We offer unique and innovative software at affordable prices. Email us at info@gooeynet.net with your questions. 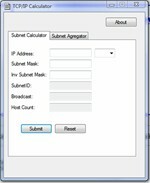 FREE simple subnet calculator free of ads. FREE simple IP Header Checksum calculator free of ads. This site owned and operated by GooeyNet Company. GooeyNet and IceComputing are trademarks of the GooeyNet Company. Send mail to webmaster@gooeynet.net with questions or comments about this web site. Copyright � 2004 GooeyNet Company.